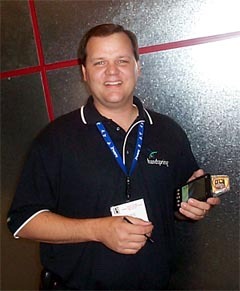 During PC Expo 2000, I had the opportunity to chat with Joe Free, GeoDiscovery's resident evangelist, about the Geode GPS module, one of the most impressive modules I saw at the show. Below is our conversation. VC (James): In the GPS market for the Handspring Visor there is obviously competition. What differentiates the Geode from some of the other products that will be available? Joe Free: I think the main thing that we designed [the Geode] for is the user experience. When you look at that, probably the [important things for] GPS are how long does it take to access the satellite? Can I even access the satellite? When I'm standing still, does it tell me which direction I'm looking? What quality of maps do I have - what kind of content do you get? We've tried to address all of these issues, so that is why we picked the SiRF Star 2chipset, because it has the fastest acquisition time that we know of at this point. We also have a digital compass on [the Geode], and with MMC cards we have the ability to put virtually unlimited applications and content on the device. Bringing all of those together is what gives a good user experience and that's what drove us. VC (James): Tell me about Wide Area Augmentation System (WAAS) and how it increases the accuracy of the Geode. Joe Free: Well it was good news for everybody when they got rid of selective availability, [which] increased our accuracy. From that point, the FAA wanted to use GPS, but it wasn't accurate enough. They put up two satellites, one on the East coast and one on the West coast, and 25 ground stations that broadcast and give you an update. It is essentially a differential GPS - it corrects your system. We have a chipset that includes the ability to incorporate that information. That takes us from 15 meters down to 2 meters of accuracy.